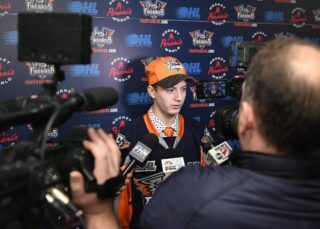 Flint, Mich. – The Flint Firebirds announced today that defenseman Marcus Gretz, a second-round pick, 23rd overall in the 2017 OHL Priority Selection, has committed to an Ontario Hockey League Standard Player Agreement and education package with the Firebirds. 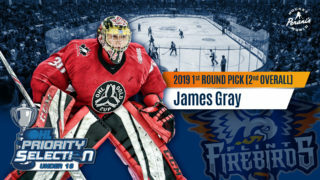 Flint Firebirds 2017 Second Round OHL Draft Pick Marcus Gretz. Gretz, a native of Macomb, Mich., was heavily recruited with NCAA options before choosing to continue his hockey and academic development in Flint. He recorded 16 points (4G, 12A) in 32 games last season while playing locally in Detroit with the Belle Tire 16U AAA Hockey Club. Gretz also tallied one goal and a plus-five rating in four games with the Total Package Hockey (TPH) Thunder AAA Club at the 2017 OHL Cup in March. Following the OHL Cup in March, Marcus was among 46 of the top American hockey players born in 2001 that was invited to USA Hockey’s National Team Development Program (NTDP) Evaluation Camp in Plymouth, Mich. He was also invited to attend the 2016 Boys Select 15 Player Development Camp in Amherst, N.Y. last July. The 2017 OHL Priority Selection was held Saturday, Apr. 8. North American players that reside in the province of Ontario, the states of Michigan, Pennsylvania and New York and other designated U.S. states east of the Mississippi River born January 1, 1998 through December 31, 2001 were eligible for selection through a 15-round process. The Firebirds’ training camp will take place Monday, Aug. 28 through Wednesday, Aug. 30. The camp will be held at the Firebirds’ practice facility, Iceland Arenas, and is open to the public with free admission for all on-ice sessions. 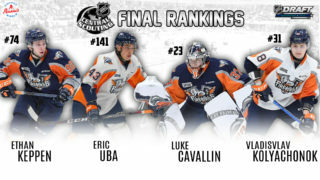 Stay tuned to www.FlintFirebirds.com for more information. Season ticket packages for the Flint Firebirds 2017-18 season are on sale now and can be purchased at the Dort Federal Event Center Box Office, Monday thru Friday from 9 a.m. to 5 p.m. (ET). Season ticket holders receive FREE parking this season. For more information, contact Kevin Mays, Director of Ticket Sales at (810) 201-6903 or kevin@flintfirebirds.com.